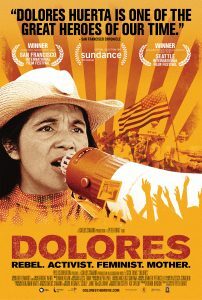 CPTV and PBS Distribution are proud to present Dolores, a documentary about civil rights activist Dolores Huerta. The film will be shown at the Avon Theater in Stamford on Wednesday, September 6, 2017. Dolores premiered at the Sundance Film Festival in January 2017, and is showing in select cities, including Stamford, this fall. Directed by Peter Bratt and executive-produced by Carlos Santana, Dolores explores Huerta’s life and legacy as a veteran activist for racial justice and labor and women’s rights, and co-founder the United Farmworker Organization with Cesar Chavez. Dolores will air on CPTV Spirit as part of the 16th season of Independent Lens in February 2018. For more information on the film, click here. For more on its Avon Theater screening, click here.